Ice Conditions: N/A, ice is gone as of 4/10/19. Fishing Conditions: No Recent reports. Rentals will resume May 18, 2019. Boat Smart Wear Your Life jacket !! 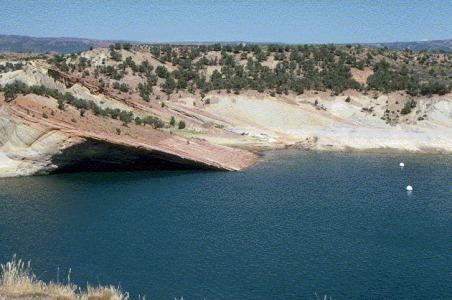 Red Fleet Reservoir sits in a rugged red rock setting, with sandstone cliffs and the Uinta Mountains as a backdrop. Red Fleet is known for the petroglyphs that adorn the surrounding area and for dinosaur footprints set in the sandstone. Red Fleet Reservoir has tested positive for quagga mussels. It was treated with rotenone in 2015 to remove invasive fish, and restocking began in November 2015. See the article: Life Returns to Red Fleet Reservoir.